Scheduled to open May 16, 2019. BOOK TEE TIME ONLINE NOW! Green fees include use of the practice facility. Power cart rental with GPS is optional, $45 per cart. Group Rates - Available for 12 or more players, complete our Request for Proposal form for more information. Kids Play Free at GolfBC! - For juniors 16 and under, when playing with an adult paying a Green Fee, valid after 1pm (in Matinee or Twilight times) 7 days a week (based on availability). Please call the golf shop at 604.938.9898 or click here for more details. Senior's Day - every Wednesday, over 65 years of age - 30% OFF Daily Green Fee! Not valid in combination with any other promotion. Ladies Night / Men's Nite - visit our in-house events page for details! 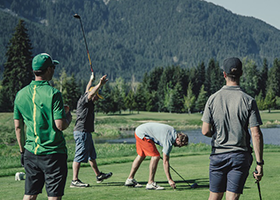 Game Packs - Save on green fees with our 6-Pack and Baker's Dozen Loyalty Game Packs! Practice Facility: Complimentary with round of golf. $30 for practice session. Cancellation Policy: 48 hours. Cancellations inside of 48 hours, or no-shows, are subject to the full charge to credit card on file. Applies to groups of less than 12 players. Dress Code: Tailored pants or shorts and collared shirt required. No jeans or cut-offs allowed. Nicklaus North is a non-metal spike facility. All prices are in Canadian Funds, and are subject to applicable taxes and availability. *Opening and closing dates are subject to weather conditions and may change. Scheduled opening May 16th; closing October 13th.